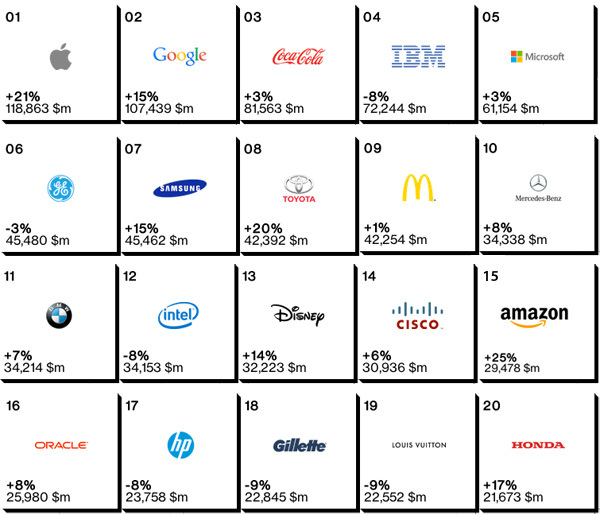 Brand company Interbrand has released its ‘Best Global Brands’ ranking of 2014. Consulting firm Accenture is the only consultancy in the list, which is, just as last year, dominated by Apple, Google and Coca Cola. Accenture is ranked #44, ahead of companies such as Cartier, Porsche and Hermès. Interbrand has measured the market value of big companies since 2000, and includes the 100 companies with the highest brand value in its ‘Best Global Brands’ ranking. Companies that want to make the list, need to fulfil quite a few criteria: a brand has to be known on a worldwide basis, needs to exceed its geographical and cultural barriers, needs to be widely present within the established economic centres of the world, have acquired a presence within the biggest markets, and have generated a revenue of at least 30% outside the country of origin. Accenture is found at #44 in the prestigious list, and is – just like last year – the only consulting firm in the list. Accenture is worth almost €10 billion, ahead of known names such as Cartier, Porsche and Hermès. Accenture owes its ranking to a successful advertisement campaign waged for years worldwide, which is centred around the slogan ‘High Performance. Delivered’. In addition, Accenture expanded its branding through a worldwide marketing strategy and a big CSR initiative known as ‘Skills to Succeed’. This programme has the worldwide goal of providing 500.000 people with skills to find a job or set up a company. There are also three UK companies listed in this year’s ranking: HSBC (#33), Burburry (#73) and Johnnie Walker (#86). HSBC dropped one place in this year’s list, despite boosting its value with 8% to $13,142 million, Burburry also increased its value with 8% to $5,594 million and climbed four places in the ranking, and Johnnie Walker dropped four places to #86, and is valued at $4,842 million.